In Savages, we actually get a look at some of the nomadic tribes that wander the edges of the Eastern empire. A brilliant general named Calojan has convinced the Aram Cosseilhatz, one of five nomadic clans, to fight on behalf of the Empire. The Cosseilhatz horse archers are so fearsome that they often make the difference in the ongoing wars and battles. Savages features a relatively large cast of main characters who take turns as the point of view for this meandering story. In addition to the aforementioned Calojan, the main players are Aimeric, a pacifist student who inherits his father’s faltering arms business, and a (for most of the novel) nameless man whose family is murdered in the opening chapter and who goes on to relentlessly reinvent himself as the story progresses. Further points of view are provided by the young prince of the Aram Cosseilhatz, a counterfeiter, and an expert art/manuscript forger. Of these characters, my favorite was easily Aimeric, the pacifist student turned arms manufacturer who ends up playing a vital role in the ongoing military campaigns by consistently coming up with creative ways to deliver huge amounts of weaponry to Calojan’s armies. He has the same sort of manic “just keep going” forward momentum as Miles Vorkosigan, playing his new role as a hyper-entrepreneurial weapons merchant with desperate gusto. “Playing a role” is actually a key concept in Savages: one of the novel’s recurring themes is reinventing oneself. The nameless chieftain has a “fake it till you make it” approach to employment: he basically says yes to any job he’s offered, claiming (entirely fictional) previous experience. Aimeric’s a pacifist playing at being an arms manufacturer. Both of them forge a new life, just like the counterfeiter makes fake money and the forger makes fake manuscripts. It’s all these forgeries and phony identities that somehow drive the plot. Despite all these clever K.J. 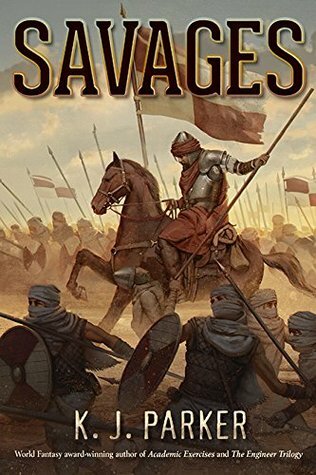 Parker hijinx, and the recognizably wonderful dialogues (seriously, Parker writes better dialogue than 99% of the field), and the many, exquisitely detailed battle scenes, Savages is a bit of a letdown in some ways. There’s some minor issues, mainly the occasional clumsy plotting: one character sneaks into a building to find a place to sleep and just happens to overhear others plotting—a coincidence that stretches belief to the breaking point. More importantly, though, the novel lacks a sense of purpose. As fun as the story is, it never feels as if it’s moving towards any kind of resolution. There’s no drive. We follow very fascinating characters interacting, evolving, leading their very different lives, but taken as a whole, the novel somehow lacks tension. Don’t get me wrong, Savages is not boring—on the contrary even—but it’s missing an antagonist, a goal, a destination, a motivation. The overarching plot mainly takes place on the macro level, with the uncomfortable relationship between the Empire and the titular “savages” its main focus, but the individual stories within that larger plot meander a bit much. Regardless, a new K.J. Parker is always cause for celebration. Looking back at the author’s biography to date, I don’t think Savages will be as highly regarded as some earlier masterpieces like Sharps (my review) or The Folding Knife, but it’s still an entertaining work by a master of the craft. This review was originally published at Tor.com on July 31st, 2015. This entry was posted in Fantasy, Reviews and tagged K.J. Parker, Subterranean Press. Bookmark the permalink.